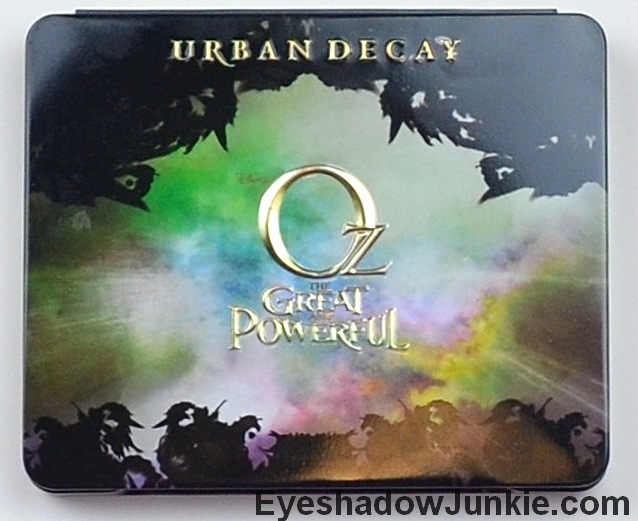 Urban Decay has partnered with Disney to create two limited edition palettes inspired by characters from the movie Oz The Great and Powerful. Each palette feature eight new shades (two are duo-shades; four full-sized single), a travel-size eye liner and a full-sized Super-Saturated High Gloss lip color pencil. The palette retails for $49 and can be purchased at Sephora, Urban Decay counters and UrbanDecay.com. Broken is a light cream with a satin finish. West is a deep brown with slight red undertones and a shimmer finish. Beware is a warm medium brown with a matte finish. Spell (duo shade) is a charcoal black with green and gold shimmer and a dark gold with gold glitter. Bewitch is a grayish brown with a satin finish. Jealous (duo shade) is a pale apple green and a dark yellow green with golden shimmer. Zero Eye Pencil is black matte and is in the permanent range. Theodora Lip Pencil is a bright warm red. The shadows are in the new formula which means the shadow has a smooth texture, great pigmentation and blends easily. The matte shade is equally as fabulous. 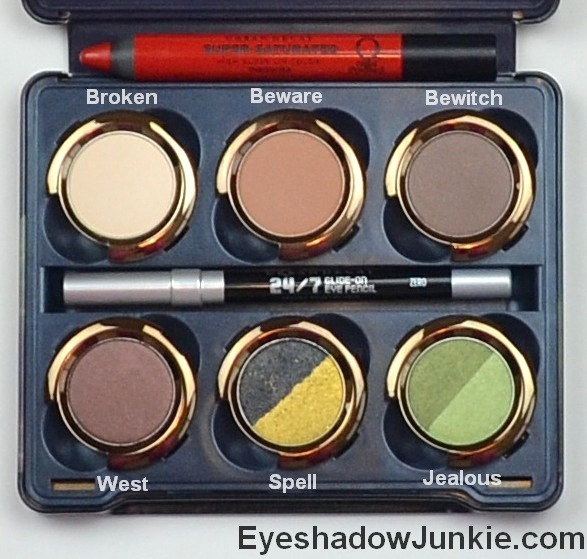 This is true for all of the shades except for the gold shade in Spell. It has heavy glitter with a lot of fallout and wandering particles. It applies better when used wet. The black side of Spell had wandering particles during swatching, but I didn’t experience any fallout when used wet on the eye. For those wondering, this shade isn’t the lovely Blackout with sparkle. It isn’t nearly as dark. I’m a huge fan of Urban Decay’s eye pencils and used to like Zero until Perversion was released and made permanent. Since Perversion is darker and better in every single way, I don’t understand why Urban Decay hasn’t retired Zero. I have several Zero’s collecting dust and this will get added to that collection. Theodora pencil is surprisingly pigmented and is opaque in a single pass. It would be better (for me) if it were a bit darker. The formula is sticky, but lasted for hours without feathering.